As chemistry teachers around the country plan activities for their students, AACT will be highlighting resources from our high school resource library that can be used to reinforce topics in different units throughout the school year. Our last post highlighted resources that could be used to support a Chemical Bonding unit. We will now focus on articles, videos, simulations, and activities that could be used in a Chemical Names and Formulas unit. Since our original post in December 2017, we have added a few more resources that you might consider trying with your students. Additionally, we have created a unit plan that uses many of our resources to help you teach a unit on Chemical Names and Formulas. An AACT news post last January highlighted a JChemEd activity, Clip Clues: Discovering Chemical Formulas that helps students improve their deductive reasoning skills by identifying unknown elements and compounds based on the bonds that they form. This hands on activity offers an easy method to give students the opportunity to learn about chemical bonding and nomenclature using inexpensive and readily available materials. The activity is easy to put together and can be used year after year. The activity, Bond with a Classmate assigns students an anion or cation so that they can form bonds with their classmates and record the formula and name of the compounds that they create. By the end of this activity, students should be able to determine formulas in correct ratios by balancing charges on ions and write compound names using ionic naming rules with correct endings. 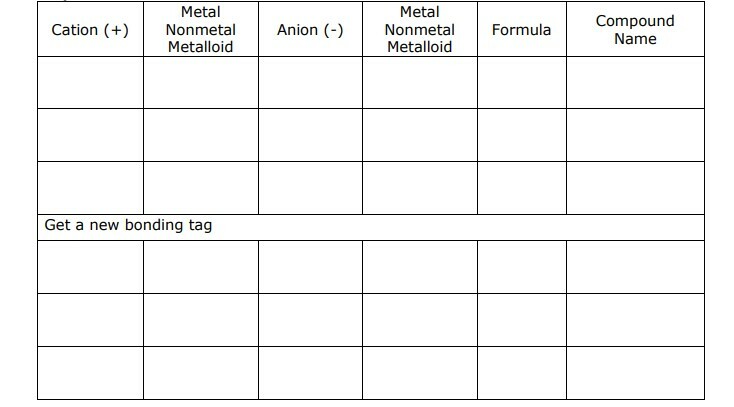 Another resource to help students write ionic compound names and formulas is the Ionic Compound Identification activity, which allows students to practice by looking at chemical samples. Each group is provided a set of three ionic compounds and are asked to write a physical description of the substance in addition to writing the name and formula. Students use ion cards of varying height (that correspond to ion charge) to build ionic compounds in the Constructing Ionic Compounds activity. After constructing compounds with balanced charges, students then write the correct name and formulas for each. In addition to a student activity sheet, this lesson provides a set of ion cards to use during the lesson. Does your school have ceramics classes or a ceramics club? The 5E lesson plan, What’s in a Name? What’s in a Glaze? connects chemistry and ionic compounds with the art of pottery. During the lesson students practice naming and writing the formulas for ionic compounds commonly found in components of glazes for ceramics. We hope that these activities can help you to reinforce topics covered in a unit on Chemical Names and Formulas. Most of these lessons were made possible by great teachers who shared their own resources. We need your help to keep the collection growing. Do you have a great demonstration, activity, or lesson related to this topic that you would like to share with the community? Please send it along for consideration. What's in a Name? What's in a Glaze?